▲ The official poster for the seminar. Provided by KUSL. 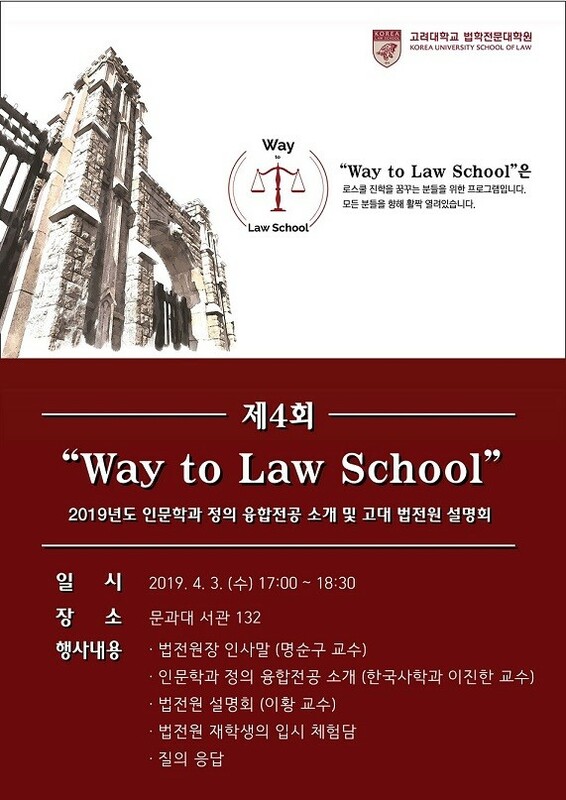 On April 3, there was a seminar about Korea University School of Law (KUSL) and Humanities and Justice (HJ), one of the interdisciplinary majors in KU. It offered related information for students who wish to enter the legal profession. As the major aims to obtain academic knowledge in the field of law, it is considered as a preliminary to studying in KUSL. The presentation started with Professor Myoung Soon-koo’s (Graduate School of Law) brief introductory greeting. He emphasized that going to law school does not always mean becoming a judicial officer. “The student can attain critical thinking ability after going through the curriculum of KUSL,” says Professor Myoung. Following his greeting, Professor Lee Jin-han (Department of Korean History), the professor in the Department of HJ, explained the necessity of understanding of humanities. He addressed the corruption issues in Korean law society and attributed the cause to a lack of humanistic sensibility. Lastly, Professor Lee Hwang (Graduate School of Law) provided detailed information on the entrance examination of KUSL. The speakers believed that law education can help the students learn how to think logically, thereby building an intellectual foundation for every field of study, including law. KUSL and HJ will help students develop the basic knowledge required for becoming professionals in their respective field.